(AFP) - Negotiations to secure an orderly Brexit deal will go down to the wire after Theresa May said she would return to Brussels for more talks on the eve of a planned signing summit. After an inconclusive trip to Brussels to meet EU chief Jean-Claude Juncker, the British prime minister said she would return on Saturday to finalise preparations for a full EU meeting the next day. It is believed that the texts of the deal will not be final before a meeting of top EU diplomats -- the summit's so-called "sherpas" -- on Friday, frustrating some European leaders. "There are some further issues that need resolution. We have given direction to our negotiators this evening. The work on those issues will now start immediately," May said in a statement on Wednesday. "I believe we have been able to give sufficient direction for them to be able to resolve those remaining issues," she said, adding that she would meet Juncker again on Saturday. 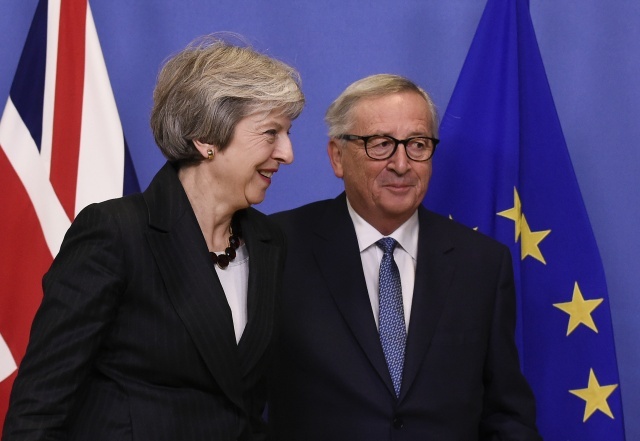 With less than four days until Sunday's meeting, a European Commission spokesperson said: "Very good progress was made in meeting between President Juncker and Prime Minister Theresa May." But she added: "Work is continuing." News of Saturday's last-ditch meeting will not go down well in Berlin, where Germany's Chancellor Angela Merkel had earlier urged negotiators not to reopen talks on the main withdrawal agreement. "I hope it will be solved by Sunday," she told German lawmakers. "We know how difficult the discussions are in Britain, but I can say for the German government that we agree with this exit agreement." Negotiators are hammering out details of a political statement on future UK-EU ties that will accompany the divorce deal, under pressure to put it together before the sherpa meeting on Friday. After enduring another parliamentary grilling at prime minister's questions in London, May slipped out of the Westminster bear pit and crossed the Channel to meet the head of the EU executive. Having seen off -- at least for now -- a potential leadership challenge by hardline Brexiteers in her own party, she hoped to wring out of Brussels a Brexit arrangement that she can sell to her parliament. The withdrawal treaty itself is all but final, and preparations are under way for Sunday's summit to sign it, but there remains the matter of the parallel 20-page political declaration on future relations. European diplomats and EU officials have been in intense talks on the declaration this week. May must show that she has left nothing on the table if she is to convince British members of parliament to ratify the deal in the coming weeks. May and Juncker were expected to cover fishing rights and the movement of goods after Brexit, as well as the duration of the transition period and the British territory of Gibraltar, which lies on an outcrop off Spain. May faces pressure from her Northern Irish allies, who oppose a deal they say weakens British sovereignty in their province, and from Spain, which has warned it might oppose the accord over Gibraltar. Madrid wants a veto over applying any agreement on post-transition relations to Gibraltar but May told MPs that Britain "will not exclude Gibraltar from our negotiations on the future relationship". There is frustration among some EU countries at Spain trying to play hardball so late in the game. "We are following the latest developments with growing concern and incomprehension -- among the EU27 our Spanish friends are all alone on this," an EU diplomat told AFP. Madrid reiterated its threat on Wednesday to vote against the draft deal. Two of May's top ministers quit last week, including her Brexit secretary, while MPs from all parties came out against the withdrawal deal -- increasing the chances that Britain will crash out of the Union on March 29 without an agreement. The withdrawal deal covers Britain's financial settlement, expatriate citizens' rights, contingency plans to keep open the Irish border and the terms of a post-Brexit transition. Opposition to the agreement is also building in the pro-Brexit camp. Anti-Europe Conservatives have savaged the divorce deal, which they say keeps Britain too close to the EU. Rebels led by MP Jacob Rees-Mogg failed in their attempt to force an immediate confidence vote in May's leadership, but warned they would keep trying. The withdrawal agreement sets out plans for a 21-month transition after Brexit, in which Britain and the EU want to turn their outline agreement on the future relationship into a full trade deal.